The Credit Continuum Approach disrupts traditional practices and transcends silo organizations to deliver bespoke solutions with risk-adjusted yield targets. A Credit Continuum strategy aims to make the most of the whole Credit spectrum ranging from liquid Corporate Bonds (both Investment Grade & High Yield) to lesser liquid assets including Secured Assets, Private Debt, and growth assets such as Infrastructure or Shipping. This solution gives access to the widest set of Credit securities, across both Euro and USD denominated currencies. The purpose is to meet the end goal of investorslooking for attractive yields by tapping opportunities across the Credit spectrum, with a focus on cash-flow generating assets and, to a lesser extent, growth assets. This investment approach transcends silo organization by giving flexibility for allocation among sectors and sub-segments. The Credit Continuum solution, while being a Buy & Watch1 solution, offers a high flexibility in terms of calibration of the key investment parameters and set of market segments. We have been living for the past few years under an unprecedented regime of unconventional monetary policies. Abundant liquidity poured into developed economies has had a number of consequences on financial markets: very low and sometimes negative interest rates, inflation of asset prices under the pressure of investors starving for returns. The hunt for yield has pushed Bond prices upwards, probably translated into much more concentrated portfolios in some market segments, possibly leading to misallocation here and there. What followed was a persistent decline in volatility and higher correlations across asset classes. By itself, this market regime is not enough to call for a turnaround anytime soon. However, we can argue that a long period of time with low volatility and high correlations could amplify market drawdowns. Of course, nobody likes drawdowns. This is especially true when it comes to Fixed Income markets where there is no “risk-free” asset anymore and where a few basis points hike in rates could cancel out a full year of income. –How would higher rates impact Bond valuations? –How to adapt portfolios in order to cope with a potentially unfriendly environment? In this context, we believe that Credit Continuum is an immediately applicable solution to address the next cycle. The Credit Continuum solution enables investors to make the most of the whole Credit spectrum including: Investment Grade, High Yield Bond investment and Private Debt. In addition, the Credit approach illustrates how we can adapt our portfolios to the current stage of the market cycle. This is less about diversification - a commodity that tends to become scarce when volatility increasesthan about allocating across a wider spectrum of market segments. The inclusion of Private Debt securities allows adding names that are not available in the Listed Bond market. Finally, this multisegment allocation strategy offers higher flexibility and reduces concentration. In the current low volatility regime, several market segments behave in similar ways. For instance, from a risk-return perspective, nothing looks more like a Corporate Bond than another Corporate Bond irrespective of its geography or sector. Consequently, there is little to expect from a traditional bottomup approach. Conversely, there is much more to expect from the investors’ ability to reallocate across segments, geographies… This implies to be able to acknowledge the market regime and to adapt the investment process towards a top-down approach that translates macro-economic scenarios, fundamentals, technicals and valuations into strategic and tactical allocations. Favoring flexibility at the expense of traditional investment style helps to adapt to these different phases. The Credit Continuum solution, while being a Buy & Watch1 solution, offers a high flexibility in terms of calibration of the key investment parameters and set of market segments. Our longstanding experience in Credit markets taught us that performance comes from Credit selection capabilities and momentum execution. Issuers’ solvency and debt structure are of course key elements but are not sufficient. Market pricing drives the realized performance. The only common feature of this Continuum of asset classes, from Investment Grade to High Yield, secured assets to Private Debt, is Credit. In order to take full advantage of a Credit Continuum strategy and to make the right calls in terms of asset allocation, an asset manager will have to pay attention to each step of the process, from the client’s risk/return profile definition to the portfolio construction and active investment. In addition to traditional Credit analysis, mixing fundamental and quantitative research to assess the strength of each Credit instrument, we are convinced that the focus on market pricing is essential to deliver return in the portfolio. The constant analysis and follow-up of liquidity features is another prerequisite to bring real value to investors. trading flows, has tightened enough. This generic example shows that building performing Credit portfolios mixing public and Private Debt over time, requires numerous axes to make sound investment decisions. A Credit Continuum portfolio is first and foremost a Credit portfolio. Picking the optimal instrument and best allocating it across the wide-ranging available submarkets requires also permanent monitoring of the constantly evolving liquidity of each segment. The specific Credit factors regroup the traditional fundamental metrics we can infer from a Credit research work and some quant indicators which estimate the sensitivity to market evolution and quantify the credit risk profile of an instrument. information through his extensive network can be a key element of success. Investing in a diversified Credit instruments portfolio does not only depend on a piece by piece analysis. The portfolio construction must not be neglected. Mixing different duration profiles crossed with liquidity provided by the contemplated instruments will give a natural cash-flow generation for reinvestment or distribution to the portfolio during the investment period. This characteristic can multiply the entry points and mitigate the market timing effect. Tracking the most sensitive bucket to Credit event within the portfolio must also be part of the rigorous process an asset manager should put in place in such an investment framework. It is in particular necessary to apply stress tests and operate a constant monitoring in order to decide whether to exit or not and at what price. To build the portfolio, the first step is to define the investor’s risk/return profile, which in turn will define the investment universe of the portfolio. 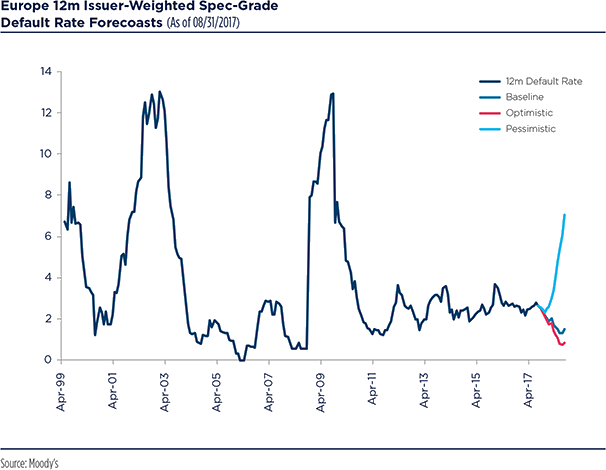 Establishing a cross-over profile will put aside the major part of the subordinated LBO debt; targeting a 4% to 6% return in Euro will make any purchase in the investment grade world very rare. So a Credit Continuum solution must be defined precisely on an ex-ante basis with the final investors. First, the tolerance for illiquidity is a key characteristic: we can sum it up by a target proportion of the portfolio in Private Debt, which can be marginal near 10%, or which can be the main goal of the product by reaching up to 100% at the end of the investment period. The length of the investment period is also important before entering an amortizing period. The longer it is the more active the portfolio can be. The investment manager can be focused on very rare and opportunistic transactions if he gets years to substitute Private Loans to conventional Listed Bonds. If he has a short time period, he will be more concentrated on classic deals such as large cap LBOs with potential secondary offers. The purpose of the Credit Continuum strategy is to make the most of Credit opportunities. 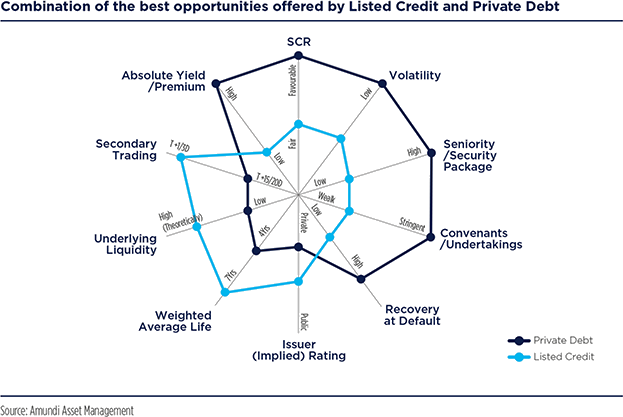 European High Yield, which consists of Corporate Bonds at the lower end of the rating spectrum, is among the most attractive asset classes within the Credit universe. High Yield in general has an atypical profile compared to other Fixed Income products due to its relatively high spread component, compensating investors for a higher credit risk. Over a long term period, High Yield exhibits a negative correlation to interest rates as well as a positive correlation to Equities. Therefore, investing into High Yield brings significant diversification to a Fixed Income portfolio. European High Yield specifically offers a compelling risk/return profile. Over the past 10 years, except for 2008 and 2011, its total return/excess return performance has always been positive, at least driven by carry. At the same time, its volatility has been much lower than Equities for comparable or higher returns. 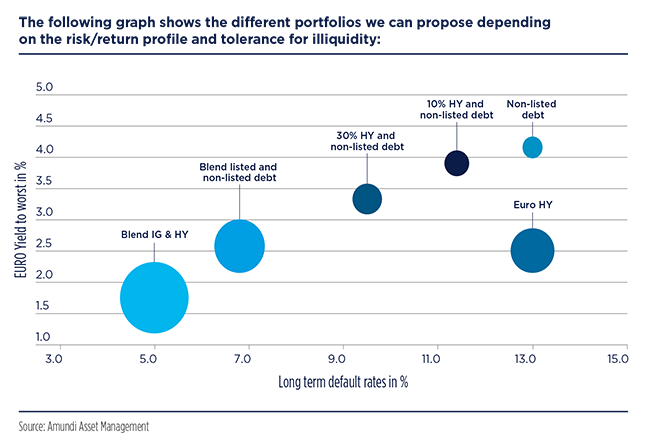 Both diversification qualities and an attractive risk/return profile have made Credit investors’ allocation into European HY more structural over the past years. 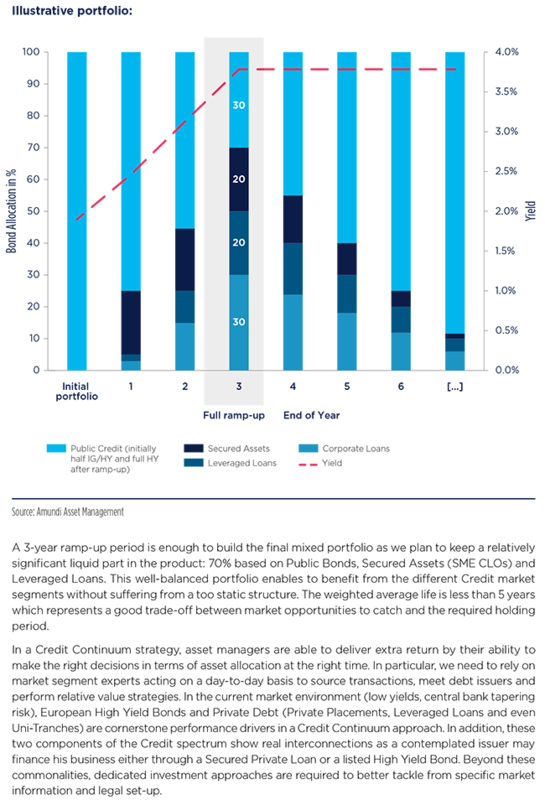 The significant growth of the asset class, from less than €50bn in 2008 to around €350bn now, and the increasing proportion of BB grades (i.e. 2/3 of the market, including Fallen Angels), have given investors more comfort, improved market diversification and above all, liquidity. With an annualized average return of +7.6% over the past 5 years, the European High Yield market has also undoubtedly benefitted from cyclical factors, including the Eurozone macroeconomic recovery and a low rate environment driven by Central Banks actions. Though not eligible to the ECB’s CSPP2, European High Yield has indirectly benefited from it with Investment Grade investors going down the rating spectrum. Should European High Yield Bonds continue to add value to a Credit Continuum strategy after such a strong performance? The answer is clearly positive as this market segment will continue to be supported by a moderate but improving growth, strong High Yield companies’ fundamentals (lower leverage, higher interest coverage, low refinancing needs, below average default rate expectations) and positive technicals as search for yield should continue in a low rate environment. Accommodative monetary policies have reached their limits, at least within the current economic cycle. The consequences of the expected more restrictive Central Banks’ policies will be a rerating of financial assets, part of which was due to very low interest rates. For the Euro zone, this does not translate into much higher spreads but this will surely put a brake on a further tightening of them. Carry more than capital gains will therefore be the drivers of performance for premium assets, notably European High Yield. In this context, Credit selection is key to avoid landmines. Private Debt offers investors an excellent way to diversify their Fixed Income exposure, allowing them to mitigate both duration and credit risk, which is particularly relevant in the current financial market environment. Private Debt is a singular asset class, with a dual DNA. While it owns similar characteristics to standard Credit Bonds, such as the search for regular income and capital preservation3, it also shares common features with private transactions markets, in particular a high level of decorrelation, as well as an access to asset classes with high barriers to entry and attractive risk premia to capture. In a Credit Continuum strategy, we progressively increase the share of Private Debt holdings until reaching the full ramp-up stage of the portfolio, as we believe Private Debt is a key driver of diversification and excess return for investors. Liquidity is one of the main parameters of the risk/return profile of the solution: it is adjusted according to the needs of the clients. The lower the liquidity of the securities, the higher the expected return to compensate. Private Debt offers investors an excellent way to diversify their Fixed Income exposure, allowing them to mitigate both duration and credit risks, which is particularly relevant in the current financial market environment. In a context of low to negative returns, modified durations of traditional Fixed Income instruments are getting higher and higher. Private Debt, through the use of floating-rate loans, provides a hedge against this increasing duration risk. In addition, by using Private Debt instruments, investors gain access to highly senior debt, with a better recovery rate in case of default. The credit risk is also mitigated by the existence of several protection mechanisms, like collateral packages and negotiated covenants. Senior Secured Loans (SSLs) illustrate very well how Private Debt instruments may be used as a way to mitigate both interest rate and credit risks. SSLs are characterized by an ultra-short duration via the use of floating-rate notes, with average interest rate reset periods of 45 to 60 days4. They also benefit from a comprehensive set of credit risk mitigation measures, from legal documentation to post-investment monitoring, enabling SSL’s holders to be ranked first in the repayment list, should any default occurs. Not only does Private Debt enable investors to reduce their exposure to major market risks thanks to its diversification properties, but it also represents an attractive asset class in terms of performance, by capturing extra return that lies in a number of additional risk premia, coming for example from a relative illiquidity and complexity of transactions. We estimate this gross extra return, which might be partly mitigated by costs inherent to stringent legal package and guarantees, to average between 75 bps and 100 bps5, compared to traditional Fixed Income returns. In order to fully leverage on the potential of the asset class in a Credit continuum strategy, we have identified five key success factors to combine: large sourcing capability, in-depth Credit analysis, thorough transaction structuring, qualitative asset allocation, and active portfolio management. In the Private Debt sector, nothing can start without having an excellent sourcing network, in order to maintain a discriminant hit ratio (1/20) and capture the best deals. During the due diligence phase, we believe it is essential to have an unparalleled access to information and management for the Credit analysis. In order to properly identify the transaction embedded risks, the ability to structure the legal documentation is also key, as it will determine our future ability to steer the relationship with the counterparty in case of Credit deterioration. When allocating between the different private markets, the main performance driver will lie in our capacity to detect the relative value among them and to identify the best risk premia to capture. Last but not least, a Private Debt strategy cannot bring value in the long term without a permanent quality assessment and an active monitoring of the constructed portfolio. While permanently adapting to the new “yield seeking” paradigm, investors have explored the Fixed Income landscape to push the old boundaries. Credit Continuum strategy is a new way to look at the Fixed Income universe, without any boundaries related to the features of financial instruments. While investors are more used to navigate market cycles, peak and valley or mean-reverting trends, the everlasting low rate environment forces asset-owners to broadly reconsider their investment approach. In the past, profound changes of investment behavior were rather triggered by disruptive events, should they take the form of a market crisis or a new regulation set-up. Today, investors are challenged by an environment whose time horizon is unknown: while it used to be seen as purely temporary, it now seems to be endless…until the next tipping point. It appears difficult in such a slow-moving and long abnormal regime to act for structural changes, should it be in the investment policy, strategic allocation, investment universe or risk budgeting. But investors have proven their capability to adapt. With different timing and degree of intervention, they have explored new territories within the Fixed Income space in order to further diversify their debt exposure and access new sources of yield. While permanently adapting to the new “yield seeking” paradigm, investors have explored the Fixed Income landscape to push the old boundaries. Supported by a financial market in continuous evolution, the “illiquid” or “real-assets” world has significantly grown and been enriched, in particular with debt financing instruments. The limits of the liquid debt universe have been reached and overcome, creating new bridges between the “liquid” and the “illiquid” worlds for a far broader range of investors; the ones able to accept a certain level of illiquidity. The destruction of this “illiquidity” wall has enabled asset-owners, more widely, to consider new asset classes like Private Debt, Corporate or Commercial Loans, etc. It has also triggered a new thinking regarding debt investment. Putting the liquidity nature of the asset in the background implies a focus shift to the underlying risk factor, should it be a corporate or financial risk, or a risk linked to real-assets projects. 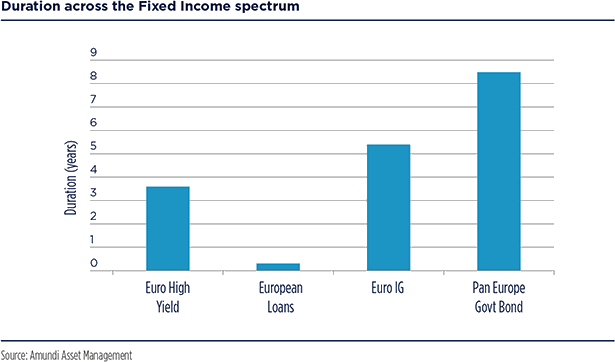 Fixed Income landscape is now considered as a Continuum across the full spectrum of liquidity. But with this fallen wall and resulting enlarged horizon, come new questions and challenges. 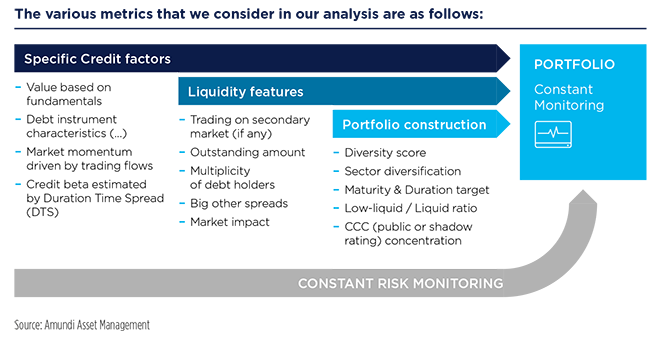 How to integrate the “illiquid” asset classes in the traditional “liquid” investment decision process? How to assess the relative value position of an opportunity within the Continuum? How should the overall portfolio blending these two natures of liquidity be constructed, monitored, and analyzed in terms of risks? How can the long-term feature of “illiquid” assets be integrated into portfolios for which the long-term risk is not even defined in the risk budgeting framework? Credit Continuum strategy is a new way to look at the Fixed Income universe, without any boundaries related to the features of financial instruments. This new type of investment solution is focusing on the outcome rather than the mean. It allows harvesting the yields where they are, capturing the opportunities when they come, managing the inflows and outflows while coupons are paid or committed assets for illiquid investments are required. The permanent relative value positioning of investment opportunities, coupled with specific investors’ objectives and constraints, appears today as the new way to unlock yields. 1. Buy and Watch is a semi-active investment strategy in which a fund buys Bonds and holds them until maturity, regardless of fluctuations in the market. Unlike Buy & Hold strategy, a Buy & Watch allows more flexibility as the portfolio manager could take preventive action when needed and do some arbitrages if Credit quality deteriorates. 4. Source: Credit Suisse. Data as at 31 December 2016.